There are many different theories on the best greyhound diet. Some people swear by the Raw Diet—just like it says Raw Meat, others will feed nothing but dry dog food, and then others who will combine different menus. Just like people, and children, dogs prefer some foods over other foods. See what your dogs prefer, tolerates and work with that. I think the best advice when choosing dry dog food is to check the list of ingredients, if there are too many ingredients this makes me think that they are trying to cover up something not so good. Also, definitely stay away from foods which contain dyes. Dyes are placed in dog food for the benefit of the person serving the food. Dogs don’t see color the way we see color so they could care less if the food is purple. Food should provide a balanced diet. It does not have to look appetizing to the person pouring it in the bowl. As your greyhound becomes adjusted to home life and realize that they will receive food on a regular basis, twice a day, they will back off and not eat like there is no tomorrow. Keep an eye on their weight and adjust the amount of food to fit their new life style. A good pet diet will keep your dogs healthy. Greyhounds should not look like four legged sausages, their knees are not designed to carry an over abundance of weight, and just like over weight people, can develop severe knee problems. 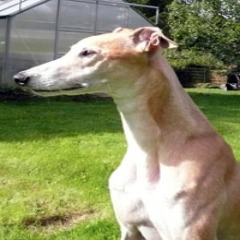 Our big male greyhounds did very well on two cups of food twice a day along with some treats. The girls do well on a cup and a half twice a day. Keep them away from cat food if you have cats, this can really upset their system and cause diarrhea. I also don’t give my greyhounds any type of raw hide chews; they don’t digest this product it tends to just lie in their stomachs undigested. Never give your dogs any Chocolate, Onion or Grapes. These foods are extremely toxic to their system. Because of their height, remember to purchase a raised feeding tray for your greyhound. Check our pet supplies page. Several years ago there was a man who decided to eat nothing but fast food for a period of time—and Super Size it. After 30 days his doctors pleaded with him to stop eating that type of diet and begin a healthier one. His weight had soared, blood pressure sky rocketed and his liver was turning into pate. He said that he knew it was not a healthy way of life but did not realize just how quickly it would turn his body to mush. Feeding your dog nothing but processed foods can do the same thing to their metabolism. They are carnivores and even though we try very hard to humanize them, they are still animals. Think about their ancestors the wolves living in the wild. Their diet consisted of small game eaten raw and in its entirety. They are not only ingesting the meat from the small animal but also the contents of the stomach from that animal. So when eating a squirrel for example they will be getting the contents of what that squirrel had for dinner, some nuts and possibly fruits and berries. All this kept the wolf nice and healthy; we should consider adding some of these foods to our dog’s diet. The racing greyhound is very often fed a diet of raw meat and vegetables, they require a lot of protein when racing but when they become house pets their nutritional requirements change. Most rescue groups begin them on a good quality dry dog food which is fine but I have always felt that having the enzymes in natural food is important. You can’t totally change their diet all at once since it will cause an upset to their systems, like suddenly becoming Vegan. A life style like that should be done gradually and with much planning. Depending on the age and current health of your dog this can take anywhere from a week to several months and should always be done with the consent and guidance of your Vet. Recently there has been a lot written about Raw Diet for dogs. It is said that it this gives a dog or cat the most digestible and absorbable nutrients available for a healthy life. The very best diet is free of antibiotics and hormones found in certified organic foods. There are several very good books and websites which talk about Raw Diet benefits and give good recipes. Keep in mind it does require more work on your part than just opening a can or pouring kibble from a bag. You have to weigh the time invested in this type of life style with the benefits of a healthier pet. 55-80% raw meat and bones—raw bones do not splinter so don’t be afraid of giving your dog a raw soup bone. 20-30% raw vegetables—carrots and broccoli are my dogs favorites, string beans are also good but no onions or raw garlic. Small amount of cooked grain-brown rice is very good and dogs tend to like it very much. Small amount of nuts and fruits excluding grapes or raisins which can cause renal failure. Some dogs are lactose intolerant so the use of dairy should be on a “case by case” situation. Small amounts of cottage cheese and yogurt are excellent sources of calcium. Before beginning any type of radical change in the diet of a dog it is recommended that they fast for 12 to 24 hours to help the digestive system better tolerate the change in foods and absorb them efficiently.